Pullman Style Dining aboard our former BR Restaurant Car. Saloon Car available for functions, meetings and parties. The Heritage Centre offers a glimpse of times past. 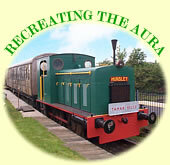 Demonstrations of shunting in the sidings. Railway mementos in the Booking Hall. The scenic Tamar Valley branch line operates regular services giving access to the local villages, the River Tamar and Plymouth (operated by Wessex Trains).